ALAMEDA, Calif. (AP) After months of questions about the health of his heart sent him tumbling down the draft board until being taken by the Oakland Raiders in the fifth round, Maurice Hurst was happy to get on the practice field and turn the conversation to football. 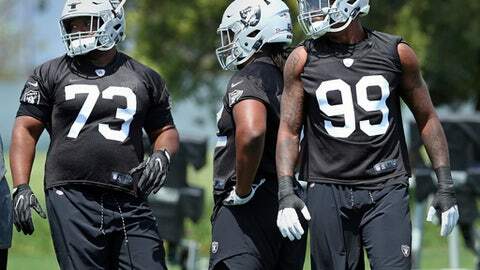 Hurst took part in his first practice as a pro Friday when the Raiders opened their rookie minicamp with three promising pass rushers they hope can bolster their defense. Hurst was one of the most productive defensive players in the country last season at Michigan. He had 5 sacks as an interior rusher and led all nose tackles and defensive tackles with 49 total quarterback pressures, according to Pro Football Focus. Hurst was sent home from the combine after a heart issue was detected. Hurst said it was something he has dealt with for a long time and hadn’t impacted him on the field. He said he has been cleared by doctors at Harvard and Michigan but that didn’t prevent every team passing on a player projected as a first-rounder until the Raiders got him at 140th overall. The additions of Hurst, second-round defensive tackle P.J. Hall and third-round defensive end Arden Key give the Raiders help on a defensive front that has ranked near the bottom of the NFL in sacks in recent years despite the presence of edge rushers Khalil Mack and Bruce Irvin. The Raiders have the second fewest sacks in the NFL the past two seasons with just 56 – one more than the last-place New York Jets. Nearly two-thirds of those sacks have come from Mack (21 1/2) and Irvin (15), as the edge players have gotten almost no help from the inside rushers. While Hurst faced questions about his health, Hall and Key had other concerns. Hall had 42 sacks and 86 1/2 tackles for loss in his college career, but that came at the FCS level for Sam Houston State instead of against top-flight competition. Gruden called Hall and Hurst the top two interior rushers in the draft, a position of major need after Oakland had just 1 1/2 sacks last year from players playing inside full-time. Key proved himself at the highest level of college football for LSU in the SEC. He had 11 sacks in 2016 and 20 overall in three seasons in college, but he has had off-field problems and checked himself into rehab last spring. If Oakland can get production out of those three players, that should go a long way in improving a defense that has been a weakness for the team in recent years. NOTES: Fourth-round pick CB Nick Nelson sat out as he heals from a knee injury. … The Raiders signed undrafted TE Marcus Baugh, WR Saeed Blacknall, LB Jason Cabinda, C Alex Officer, K Eddy Pineiro and FB Nick Sharga.